The Government of Nepal (GON) is highly supportive of all investment. It aims to create social and economic systems that can provide reliable access to good-quality, basic necessities such as education, health, and food, that can generate jobs, protect the environment, and eradicate poverty. The GON and private sector organizations work well in tandem. Through sustainable economic development, the country is working toward political stability, peace building, trade facilitation and economic capacity building. The GON has placed a high priority on industrial development in the country. To that end, the GON is focused on creating an investment-friendly environment, increasing employment, production and productivity, and substituting imports and minimizing the trade deficit by promoting export-oriented industries. 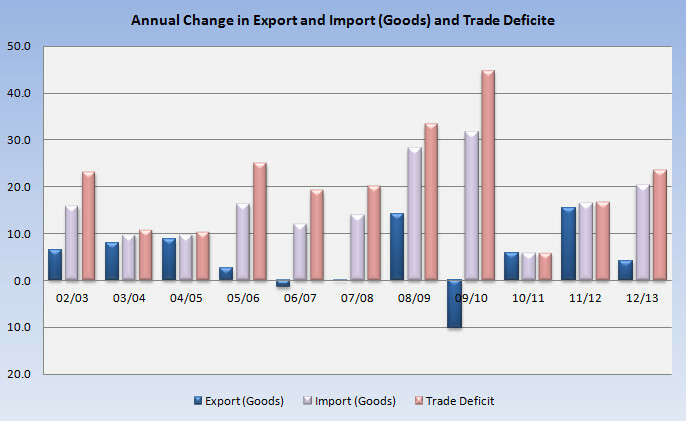 The new Industrial Policy 2010 was created to replace the Industrial Policy of 1992 with the primary objective of attracting domestic and foreign investments by improving the industrial environment, increasing industrial production and productivity, creating more employment opportunities, substituting imports through the promotion of export-based industries, and improving Nepal's balance of payment by minimizing the trade deficit. The policy has already been approved and is in the implementation phase, while preparations for the approval of the Technology Transfer Policy 2010 are in process. Likewise, a Nepal Business Forum has also been constituted to promote an investment-friendly environment and to maintain mutual trust and understanding amongst government officials, private investors, and stakeholders. 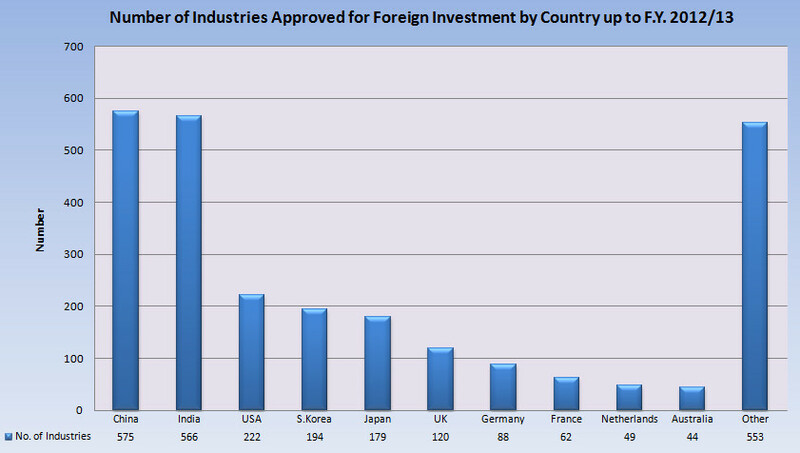 The principal attraction for foreign investors to Nepal is the size of the market. In 2012-13, Nepal had the gross national disposable income (GNDI) of NRs. 2,195,827 millions. At NRs. 95 to a dollar, this amounts to approximately $23113.968 million USD. Nepal's GDP is NRs. 1,701,194 millions, per capita GNDI in 2012-13 was $926 USD, and per capita GDP was $717 USD (CBS National Account, 2013-14). Customs, excise duties, and VAT levied on raw materials and auxiliary raw materials of export-oriented industries is reimbursed to the exporter on the basis of the amount of exports within 60 days of application. The Industrial Infrastructure Development Program was brought into effect in 2008-09 in order to develop Nepal's physical infrastructure, establish and operate feasible industries, and promote an investment-friendly environment for industrialists and entrepreneurs. Under this program, road construction and electricity transmission line expansion works are undergoing in Udaypur, Makwanpur, Dhading, Lalitpur, Dang, Rolpa and Palpa districts. Cement industries are also planned for these districts. Labor practices of Nepal are guided by the Labor Act of 1992. The creation of a new labor law is in process, and is being drafted with input from regular bipartite discussions and consultations with trade unions and employers, and with tripartite consensus of the GON, employers, and trade unions. Other Leaves Bereavement leave, special leave, leave with or without pay, etc. Note: Minimum Wage (MW) will generally be fixed by the GON on the recommendation of the Minimum Wage Fixation Committee in every two year interval. Sunday through Friday is the work week, with Saturday the weekly day off. Most offices are open Sunday-Thursday from 10:00 a.m. to 5:00 p.m., and Friday 10:00 a.m. to 3:00 p.m. In winter, for three months (Mansir, Poush and Magh, or approximately 15th November to 14th March), hours are reduced by one hour every day but Friday. The government announces other holidays often reserved for specific religions or regions. The calendar and official documents are based in Nepali B.S. Fro most private sector organizations, Saturday is a weekly day off. However, this may vary according to the nature and type of services. For 24-hour industries such as hospitals, service industries, boilers, etc., holidays are covered by their own rule and regulations. The Industrial Policy, 2010 was created to bring about positive changes in the overall economic and social sectors of the country through speedy industrial development. This policy will boost industrial development activities, create employment opportunities , increase income levels, and ultimately ensure that the industrial sector contributes to the national economy as a leading sector. Safeguard industrial intellectual property rights. The policy provides for the following institutions: Investment Board, Industrial Promotion Board, Industrial Human Resource Development Academy, Industrial Sector Management Authority, and National Productivity Council. This is in order to make policy implementation effective, promote the industrial sector, base regulatory works on efficiency and professional capacity and perform institutional strengthening works. Income tax exemption and other assistance is provided as per the nature of industry and business operation arrangements. Export-oriented industries and industries based in the Export Promotion House and Special Economic Zone are entitled to receive the declared facilities and assistance on customs duty, excise duty and VAT. Micro, cottage and small industries are entitled to receive the declared facilities and assistance on customs duty, excise duty and VAT. The policy establishes a high-level Investment Board in order to accord high priority to broad industrial investment, formulate integrated policies to protect, help and express commitments, manage necessary resources required for promotion works, and provide all types of required services and assistance to the investors from one single place. Industries established in the Special Economic Zone are entitled to receive the declared income tax exemption, VAT-related facilities and assistance, and exemptions on customs duty and local tax. A one-stop service centre will be constituted in the Department of Industry to provide facilities, assistance and infrastructure services as provded by the law. Special priority will be accorded to women industrialists wishing to establish industries inside an industrial area: the industry registration fee will be reduced by 35 percent, and 20 percent exemptions will be made on the registration of industrial property patent, design and trademark. The GON formed the Special Economic Zone Project (SEZP) on January 1, 2004 under the Ministry of Industry, Commerce and Supply (MOICS) to: formulate laws, rules and regulations; implement planning, design and construction of Special Economic Zones throughout Industrial Statistics 2010/11 Department of Industry Nepal; and to carry out relevant works. The World Investment Report 2011 indicated that Nepal's total FDI inflows were valued at $1.243 trillion USD, whereas the outflows were at $1.323 trillion. The inflows in Nepal were only 0.003% of the total, or $39 million. China is the largest contributor to foreign investment in Nepal, followed by India and the USA on the basis of registered company. Manufacturing, energy, service, tourism, minerals, construction and agriculture are the areas of greatest capital investment. 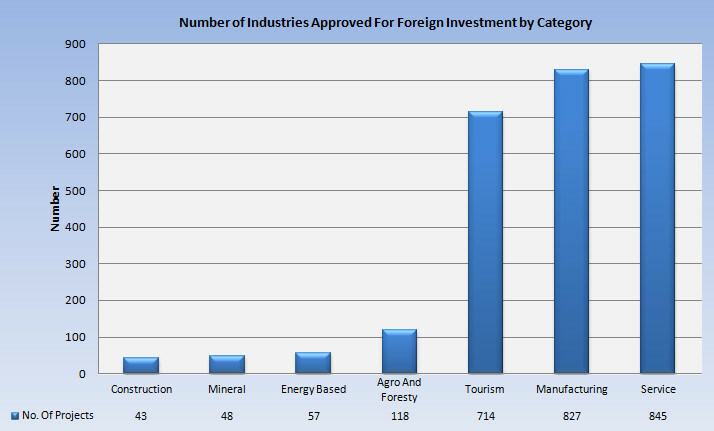 Number of industries approved for FI up to 2012- 13 in Nepal. A policy on FDI and technology transfer has been drafted to enhance FDI in the industrial sector and formulate investment-friendly environment. The approval process of the policy draft is in the final phase. The proposed policy focuses on providing a comparative advantage to the private sector and increasing competitiveness in the global market by simplifying procurement and technology transfer to increase the flow of FDI. Accordingly, a Bilateral Investment Promotion and Protection Agreement has been signed with India with the objective of promoting Indian investment in the industrial sector of Nepal, while preparations are being made to sign similar agreements with other countries. FDI and technology transfer is crucial in making the economy strong, consolidated, dynamic, competitive and self-dependent through maximum utilization of natural and human resources. FDI provides capital, advanced technology, management, technical skills, access to international market and helps in the development of competitive professional culture. In this course, among the industries approved in FY 2012/13, 43 were in agriculture sector, 1 in construction, 6 in energy, 84 in production, 5 in minerals, 89 in services, and 89 in tourism. Nepal is a small, landlocked country located between two larger and more powerful countries: India and China. Nepal maintains excellent relations with both of these countries. Nepal formally established relations with China in 1956, and the two countries have had good relations since that time. Nepal has strong traditional, cultural, religious, linguistic, and economic ties with India. A bilateral trade treaty signed with India in 1991 is subject to renewal every 5 years. A transit treaty with India, which allows Nepal to trade with other countries through the Calcutta/Haldia ports, was extended on March 30, 2006 for 7 years. Nepal played an active role in the formation of the economic development organization, the South Asian Association for Regional Cooperation (SAARC), and is the site of its secretariat. Nepal is also a signatory of the agreement on South Asian Free Trade Area (SAFTA), which came into force on January 1, 2006. A SAFTA tariff liberalization program (TLP) is being implemented. On international issues, Nepal follows a non-aligned policy and often votes with the Non-Aligned Movement in the United Nations. Nepal participates in a number of UN specialized agencies and is a member of the WTO, World Bank, and IMF.